Jorge and I are huge Thai Food fans. Until I met Jorge, I had actually never had Thai food. I wasn’t opposed to it by any means, it just wasn’t something I had ever eaten before. In my defense, Jorge and I met when I was 19…my food choices weren’t much broader than your standard teenager fare. I remember the first time I went to a Thai restaurant with him. The menu was so big and I didn’t know what half of the things on the menu were. We sat down and I scoured over the menu. We ordered drinks and he asked for a Thai Tea. I figured it was a hot tea (which is soooo not my thing), so I went for the safe option of diet coke. So when I saw the adorable bow tie wearing Alton Brown on GMA a couple weeks ago making Thai Tea Popsicles, I knew I was done for. I HAD to have them! The only special thing I had to pick up from the store was a package of Black Tea and the next day I had these babies in the freezer. The heat has been brutal these last few weeks in Tampa and I have really enjoyed reaching in the freezer and pulling out one of these flavorful ice pops. I love them so much, next time I am going to make a double batch! This is a new popsicle mold from what I have used in the past. When we moved I lost my original one…and I’m sorta glad I did, because I really love my new one (<- amazon affiliate link, FYI). It was more than I usually spend ($22), but so worth it!! Bring the water to a boil then cool for 10 minutes. Add the tea bags and steep for 15 minutes. Remove the tea bags and pour the tea into a large pitcher. Add the sweetened condensed milk, vanilla extract, salt, cinnamon and clove. Stir until well combined.Refrigerate the mixture for 8 hours (or overnight). 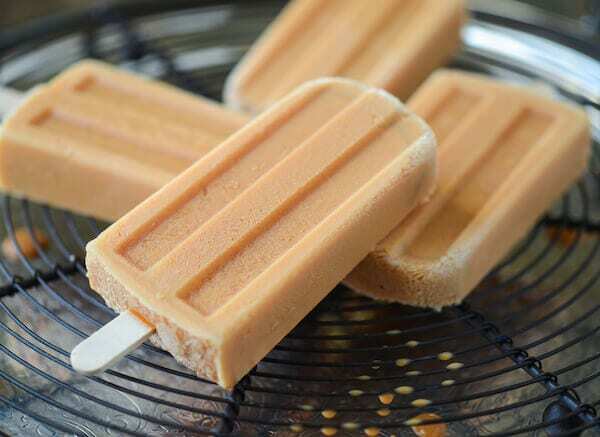 Divide the chilled mixture between popsicle molds and freeze until firm, approximately 4 hours, depending on the size of the molds. I really do not like tea, but I am thinking I could probably do tea in popsicle form! These look awesome! I love Thai ice tea! My husband and I had our first date at a Thai restaurant and it was his first exposure to Thai food. I remember I convinced him to order Thai iced tea and he loved it. This is such a great idea for a Popsicle. Love!! 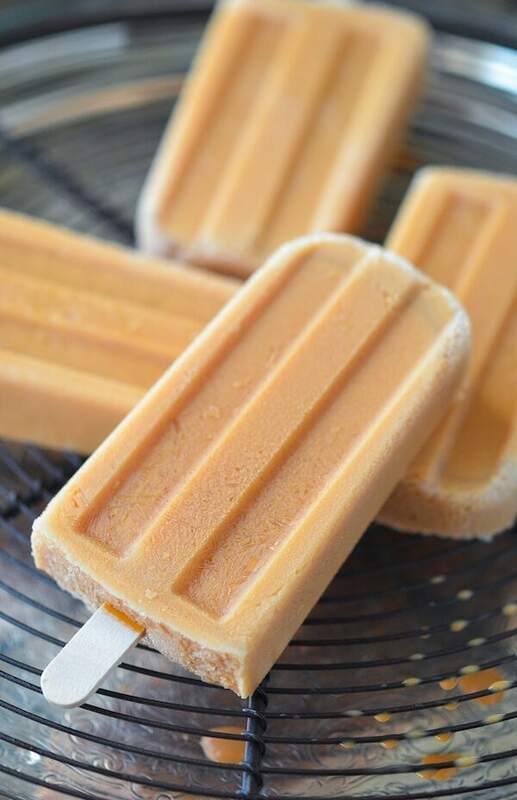 Oh wow, I have been craving Thai tea & these look fantastic! 🙂 I’m sure one would do me some good later today – it’s blisteringly hot over on Florida’s east coast too! I’ve never had Thai tea, but reading the ingredients it sounds like a thicker , sweeter version of Chai. Which I LOOOVE. Can’t wait to try these!!! I could lick about 27 of these to death right now. These sound very refreshing and delicious! I am in love with these already!! I am a Thai Iced Tea addict…how could these not be heaven?? One of my coworkers brought in Thai iced tea ice cream once and it was super fabulous…but I could totally see pops being EVEN.BETTER. 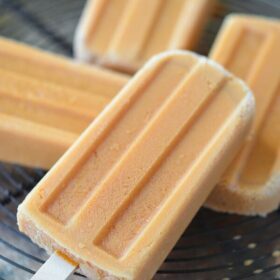 Thai iced tea popsicles?? Want. Nay, NEED. They look so refreshing. Can’t wait to give it a whirl. My son introduced me to Thai tea several years ago. These sound wonderful-and I have to share this recipe with him! Goodness gracious, how brilliant are these! They look so cool, refreshing and delicious for beatin’ the Texas heat! What a cool (pardon the pun) idea! I could eat to cool off my mouth while eating a really spicy dish. I love Thai food. I had the same expression when I went to a Thai restaurant with my friend for the first time and she ordered a Thai tea. After tasting it, I was hooked and get one whenever I can. What a great summer treat! Brilliant! I love this idea 🙂 thai iced tea is amazing!